Warned about eastern Colorado and it’s endless drab nothingness. 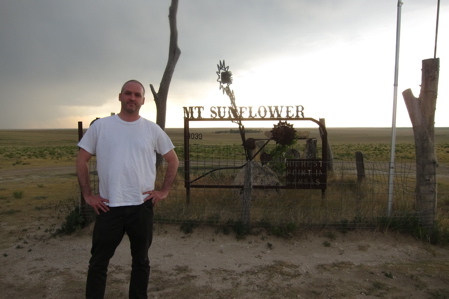 Warned that I would be overcome by unbearable ennui as I drove east from Denver, on into western Kansas. This friendly caution came, of course, from well-meaning folks from those regions of Colorado that appear in the travel brochures and National Park guides. Folks that probably had to drive through the high prairie maybe once or twice in their lives or more likely, simply flew over them several times on trips east. For my part, I wasn’t worried. The drive to the Kansas highpoint was a touch over 3 hours according to Google Maps, which meant about 2:40 for me and my lead foot. Free hotel shuttle to the airport, cross one lane of traffic to the Budget shuttle, back to the Budget lot and into a surprisingly peppy Chevy Cruze didn’t take too long and before I knew it, I was hurtling towards Kansas across the patchwork of brown and green we’ve all seen from above. Once again, as was the case for every single one of the 1,347 miles I drove on this 6 state, 4 highpoint trip out west, I was the fastest driver on the road. It’s not like traffic is a concern out here – and I saw only 2 cops set up to catch speeders on my whole trip (just outside the Denver airport at the end of my drive and a speed trap in the Rockies). I fear for these folks if and when they ever find themselves on the Merritt Parkway. I made the somewhat odd decision to exit I-70 in Limon, CO and head east via US Route 40. 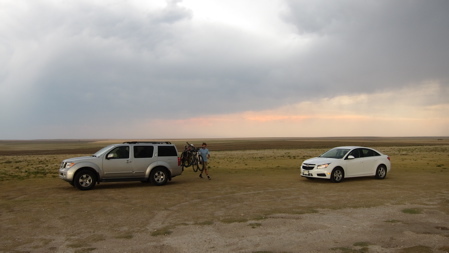 I guess I thought there would be no traffic after what I’d been told about eastern Colorado – but I was wrong. I was stuck behind people going the speed limit here and there, but I still made good time and was taking a slightly more direct route to my destination. And I did have the pleasure of driving through tiny little towns – all of which seemed to have tiny little museums, by the way – and getting a much better feel for life out here. 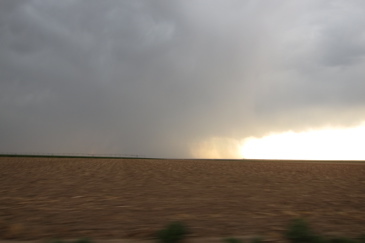 As I approached Kit Carson, CO, I had a massive and ominous looking thunderstorm on the horizon. Being wary of tornados, I stared and stared and the black mass for any sign of funnel clouds formation. Seeing none, I plowed eastward straight towards it. The number of cars heading west dwindled dramatically the nearer I got to the storm. In fact, as I reached the edge of it, the number was reduced to zero. Hm. That doesn’t bode well. One trucker waved his arms broadly across his cab at one point. 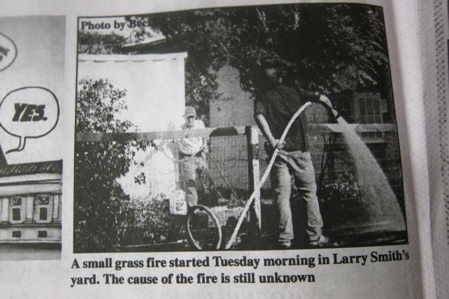 Was he waving a hearty high plains hello? Or was he telling me to stop driving towards my doom? I chose not to think about it as the first giant raindrops hit my windshield. 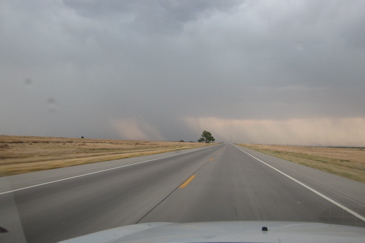 Halfway between Kit Carson and Cheyenne Wells near the Kansas border, the storm unleashed its fury on me. Suddenly, any cars that were behind me disappeared. NO cars were heading towards me through the storm. Had I made a terrible decision? Where did everyone go? I had seen a few cars in front of me turn off onto farm roads before I reached the storm… What did they know that I didn’t know? It was certainly eerie. Whatever. I kept driving. 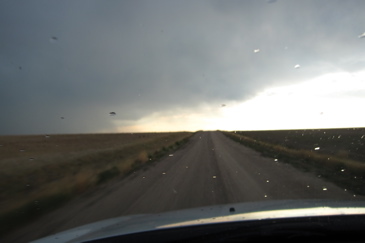 Sure, it was a deluge and yes, the winds whipped all sorts of whatnot across the road in front of me – I wondered if tumbleweeds damage was a “thing” because hundreds were blown into the side of my car. Dips in the road were suddenly pooled with water and mud. But I kept driving. I could see the backside of the storm ahead of me – which out here, may mean many miles – so I knew I’d make it through in one piece. 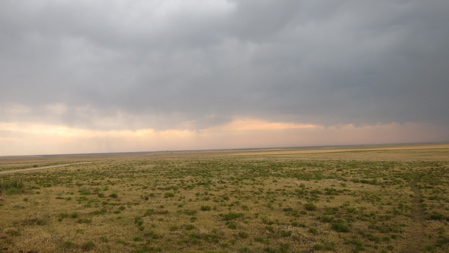 But still, I was alone in eastern Colorado. I pushed through and made it out of the storm fine right at the Kansas border. 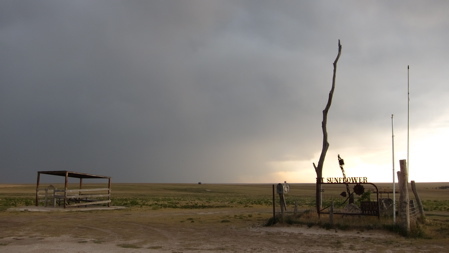 Having seen the storm for an hour before I got to it, and getting a good feel that it was headed south and not east, I felt okay about exiting the road and heading north up the 12 miles of dirt roads to the highpoint. I certainly didn’t want to get caught on Mt. Sunflower in a thunderstorm, if only because the dry dusty roads to it would then be muddy slogs. So what did I do? I drove stupidly fast up the dirt and rock road to my destination. At one point, I drove through a fairly severe dip with a sign noting that if and when it rains really hard here, I’d have to wait for the instant flooding to subside. Ok. I counted down the miles while watching the storm off to my left. I was going to make it to the summit dry and safe. 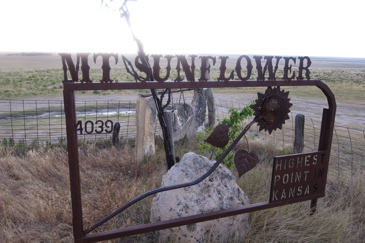 As I drove up the slight incline to the top of Kansas, I think I even did a little fist pump into the air. What in the world? Three people were riding bikes circling around the folk art summit monument. I hadn’t seen but maybe two other cars in the last hour and suddenly there was a family on Mt. Sunflower riding bikes. I got out of my car and said, “Not what I expected to see up here,” and was greeted with a reply about all the “stuff” built on the summit. “No, I meant other people. I haven’t seen anyone for miles and miles,” I clarified, but they didn’t really seem to care all that much. The cycling family drove off in a cloud of dust leaving me all alone atop Kansas. The storm, seemingly motionless to the west and the air smelling of nothing but dirt. Pure earth. It’s remarkable, really. It was a clean earthen smell; perhaps kicked up into the air by the swirling winds of the storm 20 miles away, but all-encompassing and primal. I breathed deeply and felt a rush of purity wash over me. And there I was, alone with probably no more than a dozen people within a radius of 50 miles at that moment, feeling safe and secure and lonely – but peaceful. The plains will do this to you. The strange yet beautiful Mt. Sunflower monument standing sentry over the withered fields beside me; a sun bleached tree trunk, a metal sunflower sculpture, a small roofed picnic pavilion. The family that owns this land cares about its significance and invites travelers to their farmhouse, a couple miles to the west. They recognize the absurdity of the “mount” in the name and merely asks visitors to keep the place clean. 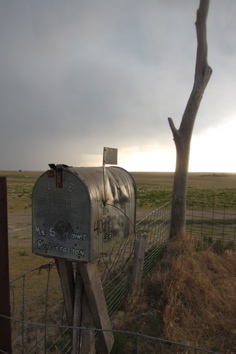 A huge mailbox is filled with all sorts of information about the highpoint and I stocked with a weather beaten register loaded with names of previous travelers such as myself. I was happy in the moment, wishing my wife was with me, yes, but still happy. 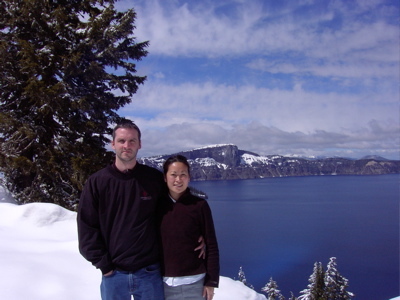 This was one of those highpoints that I often wondered how my life would ever allow a simple visit – and it couldn’t have been any simpler than this. I hopped back in the car and reversed course back out to the paved road and then continued west to Sharon Springs. The Oak Tree Inn there is a large, actually pretty nice motel with all the amenities – free WiFi, fridge, an exercise room – and a diner that serves as motel office and town gathering spot. I chatted with the waitress/motel clerk for a bit and learned she grew up on Northampton, MA. Wow. Probably one of the most progressive towns in America to this… this dusty plains town, hundreds of miles from any sizeable city. I just couldn’t wrap my head around that. I choked down a rather terrible grilled chicken sandwich but enjoyed a huge salad topped with about half a pound of shredded cheese for some reason. One other guy had a room in the motel that night. By 9 PM the town was dead silent, the storm never blew east and I slept like a rock, probably with a smile on my face the whole time. To the next highpoint: Oklahoma! I’m glad you were able to catch a glimpse of how beautiful the Plains can be. I’m from NJ originally but have lived in CO for almost 30 years. The allure of the Plains takes awhile to grab hold of, but a little exploration makes it clear that it’s worth the trip. If one knows where to go, the scenery is as breathtaking as anything the “mountain” states have to offer. I wouldn’t trust one Bostonian’s assessment of all drivers out West. Complaining about drivers elsewhere is a time-worn (and hack-y) tradition, but I’ve found it’s mostly a bunch of bull crap and really has no merit whatsoever. But while, we’re at it, see what happens in LA when they get a 1/16th of an inch of rain. Complete breakdown of the social compact.